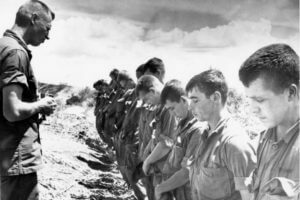 WASHINGTON – A tribunal of the U.S. Archdiocese for the Military Services has wrapped up its nearly four-year inquiry into whether the life of Father Vincent R. Capodanno, a Vietnam War hero and U.S. Navy chaplain, merits consideration for sainthood. Archbishop Timothy P. Broglio, who heads the Washington-based military archdiocese, announced May 21 that the archdiocesan phase in the Maryknoll priest’s cause has concluded. His announcement came at the end of the 23rd annual memorial Mass celebrated to honor U.S. military members, living and dead, at the Basilica of the National Shrine of the Immaculate Conception in Washington. The decision clears the way for the tribunal’s findings to go to the Vatican’s Congregation for Saints’ Causes for its review and a possible decision on whether to advance the priest’s cause to the next stage in the sainthood process. Father Capodanno, a Navy chaplain who served with the Marines, died in Operation Swift in the Thang Binh district of the Que Son Valley. He went among the wounded and dying, giving last rites. Wounded in the face and hand, he went to help an injured corpsman only yards from an enemy machine gun and was killed. He was 38. In 2002, Father Capodanno’s canonization cause was officially opened. In 2004, the initial documentation for the cause was submitted to the Congregation for Saints’ Causes. In 2006, a public decree of “servant of God” for Father Capodanno, a native of Staten Island, New York, was issued by the military archdiocese. The archdiocese also established the Capodanno Guild – www.capodannoguild.org – to raise funds and support for the sainthood cause.